"Cast Members" who work at the Magic Kingdom have been assigned iPads, and are using Apple's touchscreen tablet to track data from new wireless radio-frequency identification (RFID) posts. The new RFID system scans select park-goers' FastPass cards, if they have been selected to test the new system, as first reported by Inside the Magic. When guests scan their RFID FastPass card, the data is sent to a Disney employee who is carrying an iPad, according to Fox News. The iPads not only allow employees to track data with the test-run of the new system, but also to assist customers who may experience quirks with the RFID cards. The test is currently restricted to a select group of Magic Kingdom guests. Disney has not offered a way for customers to sign up for the test. 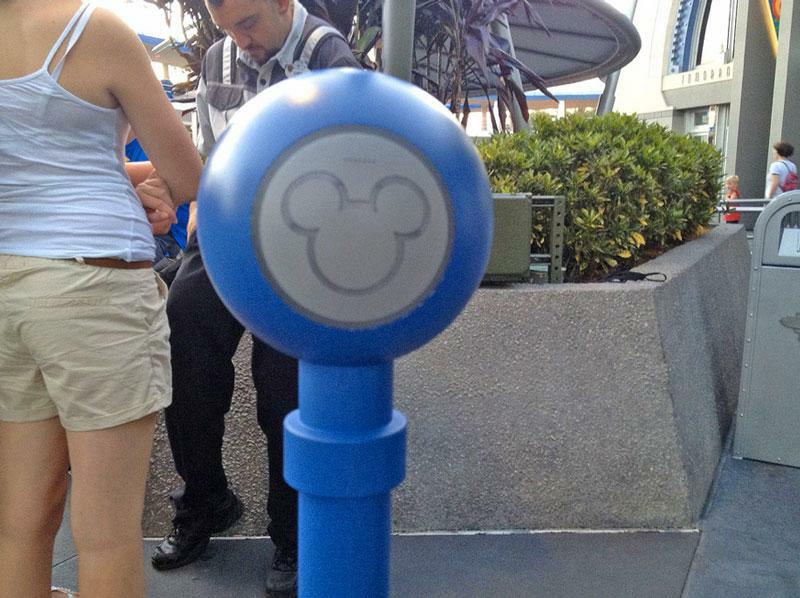 The temporary RFID scanners can currently be seen around the park in the form of blue posts with the iconic Mickey Mouse logo design on top. The posts are expected to be removed once the test run is completed, as they do not match the themed areas of the park. Disney's new RFID FastPass system provides Cast Members with data on their iPads. Photo via Inside the Magic. The use of iPads and RFID cards are part of Disney's new ticketing system, dubbed "NextGen," which aims to make it faster and easier for park-goers to gain faster access to rides and other attractions. The new RFID cards will also serve as room keys for park goers, and will be used to trigger interactive features when exploring the parks in Central Florida. In its current form, the FastPass system simply issues a paper receipt to a customer, giving them a window of time in which they can come back and skip the lengthy lines to access an attraction. The relationship between Disney and Apple remains close, as the company's chief executive, Bob Iger, joined Apple's board of directors last November. Iger was also responsible for the $7.4 billion acquisition of Pixar from Apple co-founder Steve Jobs in 2006 in 2006. That deal made Jobs Disney's single-largest shareholder.